Breaching Whale is a cloisonne jewelry piece created by Patsy Croft. It belongs to Ocean collection of amazing enamel jewelry with unique jewelry designs. 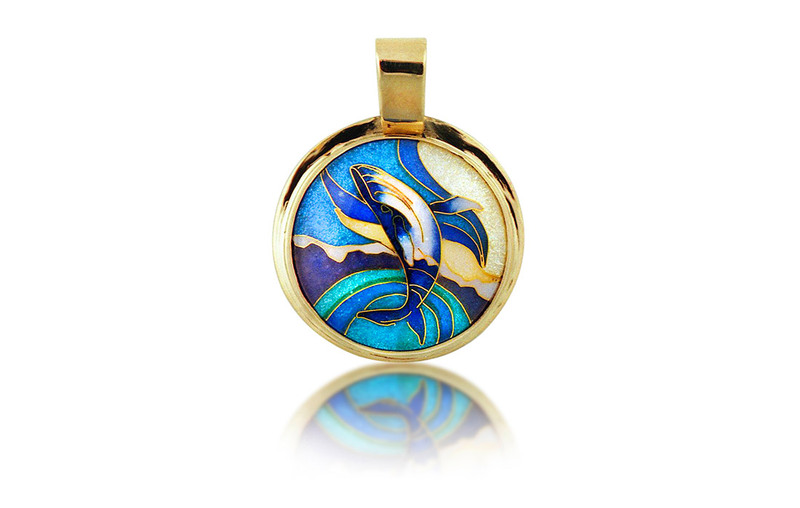 Cloisonne jewelry – enameled whale is set in an 18k gold. Like breaching, lobtailing is common amongst active cetacean species such as sperm, humpback, right and grey whales. … Lobtaling often occurs in conjunction with other aerial behaviour such as breaching. Species with large flippers may also slap them against the water for a similar effect, known as pectoral slapping. Living in Hawaii gave me the wonderful opportunity to view The Humpback Whales behavior. I must say it was spectacular! Such large creature and so strong. As an advanced diver being able to see these marine animals close, and on many occasions inspired me to make jewels to remind individuals how awesome they are. And to take care of our gifts.